Who will be the Prince among the chefs? The way to make traditional food in a modern manner will be revealed to us in the coming weeks by six young talented chefs who will fight for the title of “Prince among the chefs“. 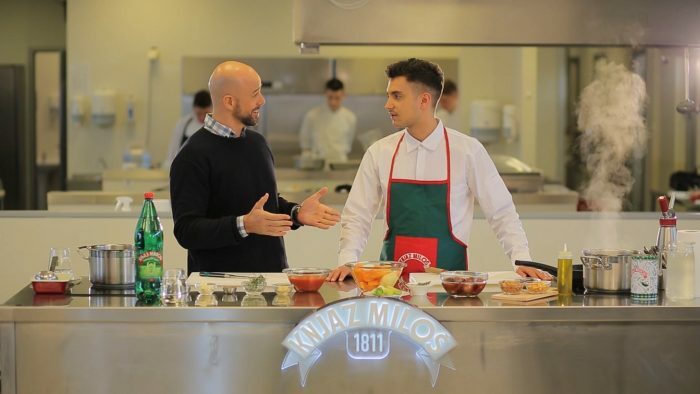 They will present their culinary skills in broadcasts on the web site of Knjaz Miloš brand, along with one of our favorite hosts, Mr. Kitchen, who is famous for his excellent recipes. The viewers will be able to vote for their favorites on the above mentioned web site and thereby send three best chefs to the finals. However, only one of them will take the title “Prince among the chefs“, which will especially gladden all lovers of good food who will enjoy his culinary tips all year long. Searching for recipes which make an ideal combination with natural spring carbonated water Knjaz Miloš, which is an indispensable part of our table, young chefs will prepare a number of delicious specialties in new ways. Since they are members of the Serbian Juniors Chefs Club, who recently won the silver medal at the world culinary competition in Luxembourg, there is no doubt that gourmands and lovers of traditional cuisine will be delighted with their excellent recipes and cooking techniques, servings, and composition of delicious meals.